No systematic ideation seems able to measure the universe—a one-to-one map even of the subjective world can probably only be achieved in non-ideational states. Nothing can be posited—“nevertheless, it moves.” Something comes into cognition, and consciousness attempts to structure it. This structure is then taken for the bedrock of reality, and applied as a mappa mundi—first as language, then as ideology inherent in language. These language/ideology complexes tend to become orthodoxies. For example, since the Enlightenment it has been considered indisputable that only one mode of consciousness is fully real; we might call it the consciousness that “falsifies”—i.e., that verifies science as true. Before the Enlightenment other orthodoxies held sway and valued other forms of consciousness or cognition. We could sum up these earlier orthodoxies under the rubrics of God and Nature, and perhaps associate them with the Neolithic and Paleolithic, respectively. Although these worldviews retain some adherents they have been archaeologically submerged, so to speak, by “Universal Reason”. The Enlightenment coincides with the first determined breakthrough into scientific instrumentality and the “conquest of Nature”; God survives the onslaught for another century but finally (after a deathbed scene of positively operatic length) succumbs around 1899. Nature is silent; God is dead. Ideology is rational and scientific; the dark ages are over. If we can say that the 18th century brought us the betrayal of Nature, and the 19th century the betrayal of God, then the 20th century has certainly produced the betrayal of (and by) ideology. Enlightenment Rationalism and its offshoot/rival Dialectical Materialism have expired and gone to heaven and left us “dans la merde” (as the dying Gurdjieff told his disciples), stuck in the mire of a material world reduced to the cruel abstraction of exchange and dedicated only to its own self-defacement and disappearance. The fact is that any map will fit any territory…given sufficient violence. Every ideology is complicit with every other ideology—given enough time (and rope). These complexes are nothing but unreal estate, properties to be stripped of assets, vampirized for imagery, propped up to keep the marks in line, manipulated for profit—but not taken seriously by grown-ups. For the adult of the species there remains nothing but the atomized sell of exchange, and the unlikely consolations of greed and power. But there appear to exist other consciousnesses, and perhaps even kinds of cognition that remain uninvolved in consciousness in any ordinary sense. Aside from all scientific or religious definitions of these other forms, they persist in appearing, and are therefore potentially interesting. Without ideologizing these forms, can we still say anything useful about them? Language is still traditionally deemed ineffective in this regard. But theoria, originally in the sense of “vision” or insight, possesses a sudden and drifting nature, akin to poetry. In such terms could we speak of a kind of hermetic criticism (on the model of Dali's “paranoia criticism”) capable of dealing with these other forms, however obliquely and glancingly? It is Hermes who bridges the gap between the metalinguistic and the sublinguistic in the form of the message, language itself, the medium; he is the trickster who leads in misleading, the tremendum that echoes through the broken word. Hermes is therefore political, or rather ambassadorial—patron of intelligence and cryptography as well as an alchemy that seeks only the embodiment of the real. Hermes is between text and image, master of the hieroglyphs that are simultaneously both—Hermes is their significance, their translatability. As one who goes “up and down” between spirits and humans, Hermes Psychopomp is the shamanic consciousness, the medium of direct experience, and the interface between these other forms and the political. “Hermetic” can also mean “unseen”. The late Ioan Couliano pointed out that Renaissance Hermeticism offered, as one definition of magic, the influence of text/image complexes “at a distance” on the conscious and unconscious cognition of subjects. In a positive sense these techniques were meant for the “divinizing” of the magus and of material creation itself; thus alchemy is seen as a freeing of consciousness (as well as matter) from the heavier and more negative forms and its realization as self-illumination. But as Blake—himself a great hermeticist—pointed out, everything has its “form and spectre,” its positive and negative appearance. If we look at the positive “form” of hermeticism we see it as liberation and therefore as politically radical (as with Blake, for instance); if we regard its “spectre”, however, we see that the Renaissance magi were the first modern spies and the direct ancestors of all spin-doctors, PR men, advertisers and brainwashers. “Hermetic criticism” as I see it would involve an attempt to “separate out” various formal and spectral aspects of communication theory and its modern applications; but this realm is choked with undergrowth and clear separations can rarely be defended. Let's just say we're looking for patches of sunlight. The critique of the Image is at the same time a defense of the Imagination. If the spectral hermeticism of the totality consists of the totality of its imagery, then clearly something can be said in defense of iconoclasm, and for resistance to the screen (the media interface). The perfection of exchange is presented as a universal imaginaire, as a complex of images (and text/image complexes) arranged through reproduction, education, work, leisure, advertising, news, medicine, death, etc., into an apparent consensus or “totality”. The unmediated is the unimagined—even though it is life itself we're discussing, we have failed to imagine it, or to evaluate it. That which is present but remains unrepresented also remains virtually unreal for us, inasmuch as we have capitulated to the consensus. And since consciousness actually plays a rather miniscule role here, we all capitulate at least most of the time, either because we can't stand too much reality, or because we've decided to think about it later, or because we're afraid we're insane, and so on. Byzantine Iconoclasm and (later) Islam attempted to cut through the hermetic dilemma by “prohibiting” the Image. To a certain extent the latter succeeded, so that even its representational art deliberately refused perspective and dimensional illusion; moreover, in a way that Benjamin might have noticed, the painting never stands alone but is “alienated” by text that enters it and flattens it yet more. The “highest” arts are architecture as arrangement of organic space and calligraphy as arrangement of organic time; moreover the word is ideological for Islam—it not only represents logos but presents it as linearity, as a linked series of moments of meaning. Islam is “text-based” but it refuses the Image not simply to exalt the text. There are two “Korans” in Islam, and the other one is generally interpreted as integral with Nature itself as a kind of non-verbal semiotics, “waymarks on the horizon.” Hence the geomorphism of the architecture, and its interaction with water, greenery, landscape and horizon—and also its ideal interpenetration by calligraphic text. Now admittedly this ideational or religious complex can assume its own intense rigidity and heaviness. Its truly luminous organicity can perhaps best be appreciated in old anonymous unofficial forms like the domed caravansaries of Central Asia or the African mud mosques rather than in the grand imperial Masterpieces— or the catastrophic modern capital cities of Islamdom. But wherever the Image has been lost and forgotten (or at least supplanted to some extent by other possibilities) it is possible to feel a certain lightness or relief from the burden of the image, and a certain lightness in the sense of luminousness as well. Even in modern Libya, which has banned all commercial advertising (and allows signs only in Arabic), one can experience at least a moment of the utopia of the absence of the image, the public image, the hieroglyphics of exchange, the iconolatry of representation. One can reject the authoritarianism of the ban on imagery without necessarily rejecting its intentionality. We could interpret it in a sufiistic manner—that a voluntary self-restraint vis-a-vis imagery and representation (a sublimation of the image) can result in a flow of power to the autonomous (“divinized”) imagination. This could also be envisioned as a suppression-and-realization in the dialectical sense. The purpose of such an exercise, from a sufi perspective, would be to channelize the “creative imagination” toward the realization of spiritual insight—for example, revealed or inspired texts are not merely read but re-created within the imaginal consciousness. Clearly this direct experience aspect of imaginal work may raise the question of one's relation with orthodoxy and mediated spiritual authority. In some cases values are not merely re-created, but created. Values arc imagined. The possibility appears that orthodoxy may deconstruct itself, that ideology may be overcome from within. Hence the ambiguous relation between Islamic authorities and Islamic mystics. Thc sufi critique of the Image can certainly be '“secularized” to the extent of adding to our own concept of hermetic criticism. 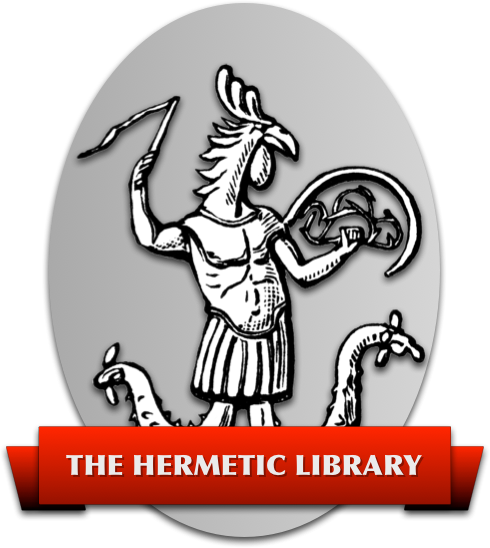 (Some sufis were themselves hermeticists and even accepted the existence of Hermes Trismegistus as a “prophet”.) In other words, we do not oppose the Image as theological iconoclasts but because we require the liberation of the imagination itself—our imagination, not the mediated imaginaire of the market. Of course this critique of the image could just as well be applied to the word—to the book—to language itself. And of course it should be so applied. To question a medium is not necessarily to destroy it, in the name of either orthodoxy or heresy. The Renaissance magi were not interested merely in reading the hieroglyphs but in writing them. Hieroglyphics was seen as a kind of projective semiotics or textual imaginal performance produced to effect change in the world. The point is that we imagine ourselves rather than allow ourselves to be imagined; we must ourselves write ourselves—or else be written. If oppression emanates from the power of that which is seen, then logic might compel us to investigate the possibility that resistance could ally itself with the power of that which is unseen. The unseen is not necessarily the invisible or the disappeared. It can be seen and might be seen. It is not yet seen—or it is deliberately hidden. It reserves the right to re-appear, or to escape from representation. This hermetic ambiguity shapes its tactical movement; to use a military metaphor, it practices guerrilla techniques of “primitive war” against those of “classical war”, refusing confrontation on unequal terms, melting into the generalized resistance of the excluded, occupying cracks in the strategic monolith of control, refusing the monopoly of violence to power, etc. (“Violence” here also signifies imagistic or conceptual violence.) In effect it opposes strategy (ideology) with tactics that cannot be strategically bound or ideologically fixed. It might be said that consciousness “alone” does not play as vital a role in this as certain other factors (“Freedom is a psycho-kinetic skill”). For example, there is an aspect of the unseen that involves no effort, but consists simply in the experience of places that remain unknown, times that are not marked. The Japanese aesthetic term wabi refers to the power of such places or objects—it means “poor”. It is used to refer, for example, to certain teacups that appear badly-made (irregular, unevenly fired, etc. ), but upon a more sensitive appraisal are seen to possess great expressiveness of “suchness”—an elegance that approaches conceptual silence—something of the melancholy of transitoriness, anonymity, a point at which poverty cannot be distinguished from the most refined aesthetic, a quintessence of the Taoist yin, the “mysterious power” of flowing water or empty space. Some of these teacups sell for millions. Most of them are made by Zen artisans who have achieved the state of wabi, but it might be said that the most prized of all would be made unselfconsciously (or even “unconsciously”) by genuinely poor craftsmen. This mania for the natural and spontaneous also finds its expression in the Taoist fondness for bizarre rocks that stimulate the imagination with convolutions and extrusions and strange imbalances. Zen gardeners prefer rocks that suggest distant mountains or islands, erasing all other images, or better yet rocks suggestive of nothing at all—non-ideational form—perfect poorness. As soon as something is represented it becomes an image of itself, semiotically richer but existentially impoverished, alienated, drawn out of itself and extenuated—a potential commodity. The wabi of the teacups is seriously compromised by the high prices they command. To be effective (to produce “satori”) the object must be experienced directly and not mediated in exchange. Perhaps the really valuable cups are not yet seen because they are overlooked. No one can even perceive them, much less their value. The sole and spontaneous exception to this general inattentiveness is…ourselves!—we have imagined the value of wabi for these objects times or places—for ourselves. These are perhaps among the “small pleasures” that Nietzsche says are more important than the great ones. In some cases the melancholy aspect of these things is exacerbated by the realization that time itself has overcome ugliness and turned it into an unnoticed beauty. Certain streets in North Dublin capture this quality perfectly, as do some abandoned New Jersey industrial sites where the organic (rust, water, weeds) has sculpted old machinery into spontaneous pure form and landscape. This melancholia (which was held to be a trait or sign of creativity by the old hermeticists) approaches another aesthetic term, the Persian word dard—which literally means “pain”, but is applied in more subtle terms to the art of direct expression of certain musicians (especially singers) in the sense of a transparent and unaffected melancholic longing for an absent transcendent or beloved. The Persian fable teaches that the pain of rejected love turns an ordinary sparrow into a nightingale. The lover is poor as the dervish is poor, because desire is that which is not fulfilled—but from this poverty there emerges an aesthetic of wealth, an overflowing, a generosity or even painful excess of meaning—under the guise of melancholy and disappointment. Aside from the inadvertancy of the unseen, there also exists a more active form, so to speak—the form of the deliberate unseen. This is part of the sphere wherein appears the consciousness of everyday life of itself and its tactical intention to enhance its own unmediated pleasures and the autonomy of its freedom from representation. Thus conditions are maximized for the potential emergence of “the marvelous” into the sphere of lived experience. This situation resembles that of the artist—but “art” enters this space only on condition that it refuses to mediate experience for us and instead “facilitate” it. One example would be a love affair based on an eroticism that does not appear in mediation, for which no “roles” are constructed, no commodities produced. Another example might be a spontaneous festival, or a temporary autonomous zone, or a secret society; here, “art” would regain its utility. The Renaissance magi understood that the ancient Egyptian obelisk was a perfect hermetic form for the dissemination of their hieroglyphic projective semiotics. From the top down it represents (mathematically) a sun-beam; from the bottom up, a lingam. It broadcasts or radiates its text/image complexes therefore both to the light above consciousness itself, and to the unconscious represented by sexuality. From the emblem-books such as the great Hypnerotomachia of 1499 we learn that the hermetic purpose for such monuments would be to call into existence the utopia of desire and the bliss of alchemical union. But the Magi never perfected their deciphering of the hieroglyphs and their utopia remained enclosed within the hermetic landscapes of the Emblems. The notion of the power of the obelisks, however, took root in western consciousness and unconsciousness, from the Napoleonic and British appropriations in Egypt to the Masonic involvement in the Washington Monument. By contrast to the obelisk of the State, one could imagine a genuinely hermetic obelisk inscribed with magical writing about direct experience of non-ordinary consciousness; its effectiveness would consist of the near-impossibility of its being seen; it might, for example, be sited in a remote wilderness—or in the midst of abandoned industrial decay. It might even be buried. It would be a “poor” obelisk. Rumors would circulate about it. Those who actually found it would perhaps be deeply moved by its mysteriousness and remoteness. The obelisk itself might even have vanished, and been replaced again with a beam of dusty sunlight. But the story of it might retain some power. 5. The Organic Machine But what is revolt for? Simply to assuage the terminal resentment of the eternally disappointed and belated? Could we not simply cease our agitation and pursue that teacup or that beam of sunlight, if we cannot be satisfied with the ecstasy of the totality? Why should our hermetic critique lead us to an assertion of a dialectic of presence over exchange, over alienation, over separation? If we pretend to “create values” then we should be prepared to articulate them, however much we may reject “ideology”. After all, pancapitalism also rejects ideology and has even proclaimed the end of the dialectic—are our values therefore to be subsumed in Capital? If so, then—why struggle? One possible response to this question could be made on the basis of an existentialist revolt-for-revolt's sake, in the tradition of Camus or the Italian Stirnerite anarchists. We would be ill-advised to despise this answer—but it may perhaps be possible to add to it in more positive terms (in terms of “form”, not “spectre”). For example, we could say that the Paleolithic economy of the Gift still persists, along with the “direct experience” spirituality of shamanism, and the non-separation of “Society Against the State” (Pierre Clastres), in the form of those rights and customs discussed by E. P. Thompson, reflected in myth and folklore, and expressed in popular festal and heretically resistant forms throughout history. Refer to Bakhtin's Rabelais, to Christopher Hill's Word Turn'd Upside Down, or Vaneigem's Free.Spirit. In other words: a tradition of resistance has persisted since the Neolithic, unbroken by the rise of the first States, and even till today. Thus: we resist and revolt because it is our glorious heritage to do so—it is our “conservatism”. This resistance movement has become incredibly shabby and dusty since it first arose some 12,000 years ago in response to the “first ideologies” (agriculture, the calendar, the appropriation of labor)—but it still persists because it still defines most of the “empirical freedoms” that most people would like to enjoy: absence of oppression, peace, plenty, autonomy, conviviality or community, no rich or poor, spiritual expression and the pleasure of the body, and so on. It may be impossible to construct a system or ideology or strategy on such uncategorizable desires—but it is equally impossible to refute them with ideology, precisely because of their empirical and “tactical” nature. No matter what, they persist—even if they remain for all practical purposes unseen, still they refuse to go away. When all the ideas have betrayed us, this “organic machine” (Society vs. the State) declines even to define itself as an idea. It remains loyal to our immemorial inarticulacy, our silence, our poorness. Capital pursues its telos beyond the human. Science has already betrayed us—perhaps the next (or last) betrayal will be of the human itself, and of the entire material world. Only two examples need be given here to illuminate (rather than “prove”) this contention. The first concerns money, which in the last five or six years has transcended its links with production to the alarming degree that some 94.2% of the global “money supply” now consists of pure financial capital. I've called this the Gnostic uploading of the economic body, in honor of those old Gnostic Dualists and their hatred of everything material. The practical result of this situation is staggering for any consideration of economic justice as an “empirical” concern, since the migratory or nomadic nature of pancapitalism permits “disembodied Capital” to strip the productive economy of its assets in the cause of profits that can only be measured by purely “spiritual” means. Moreover, this Capital has become its own medium, and now attempts to define a universal discourse in which alternatives to exchange simply vanish as if they'd never existed and could never exist. Thus all human relations are to be measured in money. To illustrate Capital as its own medium, and as our second example, we can look at bioengineering. There is no force that can prevent pancapitalism from acquiring patents to every identifiable gene. This means that farmers are now being asked to pay “rents” on certain genetic strains that they themselves developed, because the “rights” to those strains were acquired by the zaibatsus. The dubious triumph of cloning is supposed to compensate for the profit-driven ravaging of Nature's last remnants. Moreover, the human genome project, which has “solved” the production of life as a biochemical machine, allows “evolution” itself to be coopted and absorbed into Capital. As the market envisions the future, the human itself will become humanity's final commodity—and into this “value” the human will disappear. Capital's self defacement implies humanity's self-effacement. Acting as a purely spiritual substance—money—Capital will attain the ownership of life’s becoming, and thus the power to shape the very protoplasm of the material world as pure exchange. Our essential question then concerns the possibility of the re-appearance of the unseen as opposition. Finally it would seem that a tactical refusal of all strategic systemization may be inadequate to bring about this desired re-appearance. A positive proposal is required to balance the gestures of refusal. We must hope that an organic strategy of victory will emerge as “spontaneous ordering” from the driftwork of tactics. Any attempt to impose this strategic unity from “above” must be renounced as (at best) nostalgia for the lost utopia of ideology—or as “bad religion” of some sort. But just as the Image has its spectre and its form, so we might play with the notion that the Idea, too, has a spectral and a formal manifestation. As a “spook in the head” the idea remains nothing but a semantic trap—disguised for example as a moral imperative. But as a “form” in the Blakean sense the idea itself may take on organicity as a production of the body and the “creative intellect”, just as the image may be turned toward realization by the body and the “creative imagination”. Perhaps in some sense it is the idea that has remained unseen till now, and thus retains all its power, having never fallen away into representation. Neglected all along—having never been given a price—and perhaps remaining inexpressible even in its manifestation—this idea may “give meaning to revolt.” And it may be written ambiguously in hieroglyphs whose meaning is uncertain, but whose “magical” effect is nevertheless potent—it may be written even on a hidden obelisk. But it will have been written by us. It seems as if there should exist two possible kinds of network (or even of communication technology)— one aristotelian, text-based, linear—the other platonic, image-based, non-linear. Language, for example, as viewed from this perspective might appear more platonic, since words are based on “inner pictures” and thus cannot be limited by pure lexicality or one-to-one “translation”; while by contrast a network of computers, using digital text-based programming, might appear as a perfect aristotelian system. But this neat dualism dissolves into paradox and conundrum. Text itself is picture-based (hence “non-linear”) in Sumer, Egypt, China. Even our alphabet is picture-based; the letter “p”, for example, is simply an upside-down foot, since Indo-European words for “foot” almost always begin with “p” (or “f”). Text, which is supposed to be linear, is “language-based” and partakes of language's non-linearity. When “speech genres” are textualized they become in some senses more linear (because stripped of contextual depth formerly provided by the extra dimensions of speech such as tone, gesture, performance, etc. )—but in some other ways this stripping of language to produce text results in further ambiguities, since the context of the text now consists largely of the reader and the reader's inner world. Thus the fact that computers are digital (simple on/off switches in massive array) and text-based does not make them genuine aristotelian machines, since image is already embedded in language, and even more because the screen itself is also already an image, whether it displays image, text, or both at once. If programming could be based directly on images rather than text—as some savants believe possible—the computer could easily be seen as a platonic machine. The platonizing effect of the computer is already present not only in its screenal display of images but also in the psychological reality of the screen as image. In effect, the computer is a hieroglyphic machine, an interface mode of text and image; hence its magic appearance to the unconscious. The Renaissance magi (especially Athanasius Kircher) believed that the Egyptian hieroglyphs were purely platonic (—in this, they followed Plotinus and Iamblichus)—that is, that each image was an ideal form, and that their deployment could not only indicate meaning but also create and project it. Thus the hieroglyphs were seen as an ideal amalgam of text and image—an emblematic form of writing. Now when Champollion deciphered the Rosetta Stone, it was discovered that hieroglyphs were already used quasi-alphabetically (on the model of “[picture] foot = [phoneme] p”), although there were also cases where single images or imageclusters represented the objects depicted as words. This discovery relegated the unsuccessful translation attempts of the old magi to complete oblivion. Their theories are now only mentioned in passing as examples of “false” hermetic science and bad Egyptology. But as Couliano noted, these discarded theories have great secret heuristic power, because they describe empirically some of the ways in which text, image, and mind interact. Once the neo-platonic metaphysics and crude magical fantasies have been discarded, hieroglyphic theory can be used to understand the mode of operation of text/image complexes—that is, emblems. c) a hieroglyphic “coding” in which certain images not only represent words but also “express the essence” of those words, and project them in a “magical” manner, whether or not the reader is consciously aware of this process. Our working hypothesis is that the world's image of itself not only defines its possibilities but also its limits. The world's representation of itself to itself (its “macrocosmic” image) is no more and no less than the self’s “microcosmic” image of itself “writ large” so to speak, on the level or mentalité and the imaginaire. This is part of our “secularized” hermetic theory; it explains, for instance, why emblems have influences on multiple levels of cognition. The radical magi encountered a world wherein one world-image was locked in place—not just the geocentric cosmos but the whole Christian orthodox value system that went with it. Their subversive purpose revolved around the project of a free circulation of imagery, a breaking-up of the stasis and the creation of a more responsive model. The single world-view of orthodoxy was seen as stifling, tyrannical, oppressive. Inasmuch as the self interiorized this view it reproduced the oppression on the level of the subjective. The hermeticists opposed the very singleness of this worldview with a contradictory multiplicity, a critical form of “paganism” based on difference. Analogously, since 1989-91 we have entered a new “dark age” in which one worldview (and its imaginaire) claims hegemony over all difference. Not only is “pancapitalism” a global system, it has also become its own medium, so to speak, in that it proposes a universal stasis of imagery. The free circulation of the image is blocked when one image of the world structures the world's self-image. True difference is leached away toward disappearance and replaced by an obsessive re-cycling and sifting-through of “permitted” imagery within the single system of discourse (like the medieval theologians who supposedly quarreled over the gender of angels as the Turks besieged Byzantium). Pancapitalism “permits” any imagery that enhances profit—hence in theory it might permit any imagery—but in practice, it cannot. This is the crisis of “postmodernism”—crisis as a form of stasis, of infinite re-circulation of the same—the impossibility of difference. Within the crisis of stasis all manner of imagery can be allowed or even encouraged when it tends toward the depiction of relation as exchange—even the imagery of terror, murder, crime—even the extinction of Nature and the Human—all this can be turned (as imagery at least!) into profit. What cannot be allowed (except perhaps as nostalgia) is the imagery of relations other than exchange. Nostalgia can be contained and marketed—but actual difference would threaten the hegemony of the one worldview. The “Gift Economy” of some nearly-extinguished “primitive tribe” makes excellent TV; our mourning for its disappearance can only boost the sales of whatever commodity might soothe our sense of loss. Mourning itself can become fetishized, as in the victorian era of onyx and jet and black-plumed graveyard horses. Death is good for Capital, because money is the sexuality of the dead. Corpses have already appeared in advertising—“real” corpses. Assuming that our hypothesis holds so far, we might well ask from “whence” there could appear any image of true difference in such a situation. The obvious answer is that it would have to come from “outside” the stasis. This means war, obviously. At the very least, it means “Image War”. But how can we even begin to define what might lie “outside” the stasis? Are we not precisely engaged in a situation where all circulating images become part of the crisis of circulation? This is the “malign hermeticism” of the totality of mediation—its spectral metastasis, so to speak—ontology as oncology. Everything that enters the discourse, all that which is “seen”, is subverted by the very fact that there is only one discourse, one exchange. “Image War” might be just as productive for exchange as other forms of “pure war”, since it would at least offer an “illusion of choice”. This, then, is the hermetic crisis of the tactical media. The unseen lies at least potentially outside the space of the represented totality. Thus it becomes for tactical media a subject of great theoretical interest. But as media the tactical media must still mediate, and therefore the unseen remains “mysterious” in the precise sense of the term. Since only the seen can be described, the pure unseen cannot be written about or represented—although it can be communicated, at least in “Zen” terms. However the unseen is not necessarily “pure”. If it were pure, it would interest us a great deal less that it does, sinee it would thereby share in a characteristic we associate with ideology and stasis. In fact the unseen attracts us because of its impurity. In effect there appear to exist degrees of the unseen. The unseen can paradoxically appear even within the locked circularity of the mediated totality, either inadvertently or else by subversion. For example the TV show about the primitive tribe, and the melancholy of the disappearance of the Gift, cannot touch the unseen actuality of the Gift and its meaning for the people who know it. But sometimes the spoken text or the editing of the film will create potent cognitive dissonances with certain images that suggest the presence of the unseen, at least for a few viewers who are prepared for such irruptions of the mysterious, its “guerrilla” raids on consensus consciousness. Moreover, the “intimate media” remain relatively invisible to the totality because they are so “poor”. The petty extent to which such media participate in market economics, much less consensus aesthetics, makes them so insignificant as to render them meaningless for all practical purposes. Of course as soon as any energy and originality is seen to emanate from such media they are at once absorbed into Capital—and the unseen must retreat, drift on, evade definition, move elsewhere. But this process takes time, and time makes opportunities. Thus tactical media could make use either of “guerrilla” operations within the media totality, or of intimate media that remain (in some impure manner) outside that totality. But in either case tactical integrity would demand that such “appearances” take place only where they can be effective—in military terms: where they can damage the totality without being absorbed into its “spectacle of dissidence” and permitted rebelliousness. Tactical media will retreat from any such englobement, and in such moments of tactical withdrawal tactical media may have to engage in violence and sacrifice (at least on a conceptual level). Tactical media will make mistakes—all the more so because of its improvisational nature, the absence of any overall strategy. Because tactical media refuses purity, it will engage—and it will be defeated, very often by its own “success”. The purpose and intention of tactical media is precisely not to rejuvenate the consensus by allowing itself to be vampirized of its creative energies by the imaginaire of the UnDead and its “natural laws” of exchange. But we cannot say therefore that the purpose of tactical media “is” the destruction of the totality. This statement of identity would define an ideology or source of authority for tactical media, and limit it to the role of opposition—in effect, to its “spectral” appearance. We certainly don't wish long life and success to the totality, but by defining ourselves (or our techniques) solely as “destructive” we are simply inviting our own recuperation into the pattern of oppression. Tactical media, I suggest, should be about something and for something—this would constitute its “formal” appearance.It should be for the unseen—even for a seduction into the unseen. Does this mean that the tactics of tactical media can only be defined “situationally”? Even if we reject all ideologizing of intentionality can we still say anything descriptive about specific goals? If we refuse strategy, can we nevertheless articulate something about a tendency or movement or unifying imaginaire of presence (a “myth” perhaps) that might underlie and inform our tactical mediations? This may indeed be possible, if only because the imaginal values in the process of emergence in tactical media seem to concern those empirical freedoms expressed not only in immemorial “rights and customs” but also in the most radical politics of desire. In other words, an “organic” substitute for strategy/ideology arises from a shared imaginaire based on such traditional yet radical perspectives. It is in this way that tactical media can be seen as an aspect of a possible effective opposition to exchange itself, to the post ideological ideology of Capital—an opposition that cannot be englobed, and therefore can contemplate the possibility of victory. All this is pure hypothesis, so it would be pointless and perhaps even counter-productive to engage in any attempt to prescribe or predict or even to influence the tactical media. The historical movement envisioned here (which even faces the challenge of the very “End of History”) can make nothing out of any outmoded vanguardism or “unacknowledged legislator-ism of a discredited intelligentsia, artists, etc., etc. It does, however, seem possible lo adopt an experimental” approach. Who can foretell success or failure? An inherent weakness for narrativity, however, and a desire to work on some sort of “emblematic” structure leads me to an “aimless wandering” or taoist theorizing around certain themes considered here—notably the notions of hermeticism in both its “formal” and “spectral” aspects. For instance: since money is “imaginal” it is susceptible to hermetic manipulation—even to the “intuition” discussed by such strange billionaires as George Soros. It seems theoretically possible to “hack” money at the level of its representationality—all the more so now that most of it is pure representation. Money that can be manipulated imagistically because money itself is image, however, can also be “downloaded” from its CyberGnostic numisphere and manifested on the earthly plane as hard cash, goods, production. Thus it would appear feasible to redirect capital as wealth, away from areas where pancapitalism has “decreed” its (symbolic) presence, into areas where it has “forbidden” its (real) presence. “Decree” and “forbid” are enclosed by quotation marks because in truth the situation is so complex that “legality” has become an extremely ambiguous category. Money as medium is engulfed in the same crisis of definition as all the other media. Into this space of uncertainty, hermetic operations could be directed (in perfectly legal ways) such as to interfere with the circulation of Capital. The space of uncertainty—the crack in the monolith of representation—has its deep origin in the intense anxiety of the crisis of stasis. The image of the imaginaire as a labyrinth with no exit induces a kind of claustrophobia akin to that experienced by the Renaissance occultists in relation to the cosmic stasis of doctrine: escape panic. We are after all still “in transition” toward a perfect global market—the cosmos of economy is not yet fully and flawlessly enclosed. Hence for instance the sudden obsession with “content”. What are we going to do with all the data—what use is it? And who shall create in order that others (all others) may consume? A real puzzle. Certain elements within political structures still retain a half-hearted sentimentality about the “Social” state; they still want to help program the “content”. They are opposed by the zaibatsus that demand “pure” content, measurable only by price rather than value. But what do “the people” want? Into the tactical spaces left vacant by this clash of bewildered titans, certain mediations might be effected. The old magic power of the scribe, the hermetic initiate, might constitute a counter-force to the magic power of the manipulation of content, the monopoly of meaning and interpretation claimed by the totality (which suddenly doesn't look quite so total…). As we are discussing media, the evocation of the word “magic” seems somehow permissible. How relevant these musings might prove to situations encountered in unmediated reality—perhaps that is another kettle of fish. For now, however, we are simply exercising our imagination.